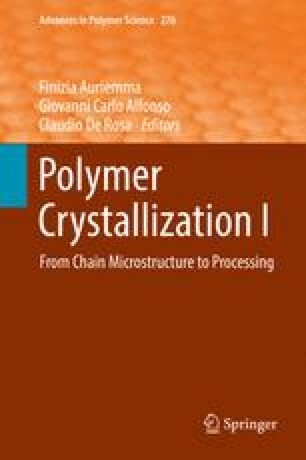 The effect of chain topology (ring versus linear polymer chains) on polymer crystallization is reviewed. Recent advances in ring closure and ring expansion synthetic techniques have made available a range of well-characterized samples with higher levels of purity than available decades ago. Cyclic molecules are fascinating because the structural difference between them and linear chains is relatively small, yet their behavior can be completely different from that of their linear analogs of identical chain length. The effect of having no chain ends can dramatically change the polymer coil conformation and diffusion rate, as well as the chain entanglement density in the melt. These changes are reflected in different nucleation and crystallization kinetics for cyclic and linear polymeric chains. However, the results published so far seem to be dependent on the type of polymer employed. Therefore, a careful look at the literature and evidence reported for each group of materials has been assembled and compared. The possible reasons for some of the contradictions in the evidence are also discussed. The POLYMAT/UPV/EHU team would like to acknowledge funding from the following projects: “UPV/EHU Infrastructure: INF 14/38”; “Mineco/FEDER: SINF 130I001726XV1/Ref: UNPV13-4E-1726” and “Mineco MAT2014-53437-C2-P”. R.A.P.-C gratefully acknowledges the award of a PhD fellowship by POLYMAT Basque Center for Macromolecular Design and Engineering.